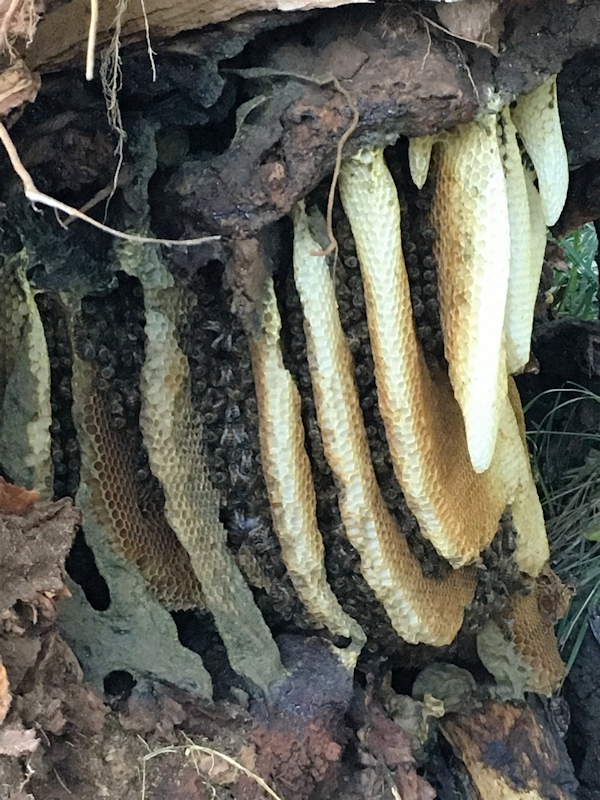 These bees had built their hive in the root of a wattle tree. It fell over and left them totally exposed. What a work of art! We put a brood box beside them, but it seems they are happy where they are and are facing the cold! 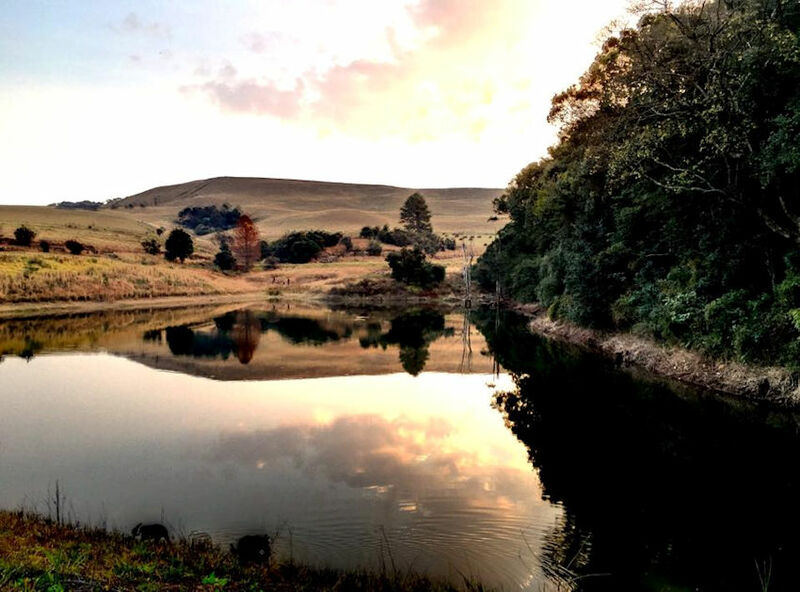 After an absence of about eighteen months, we spotted three otter frolicking in the uMngeni below the house last week. 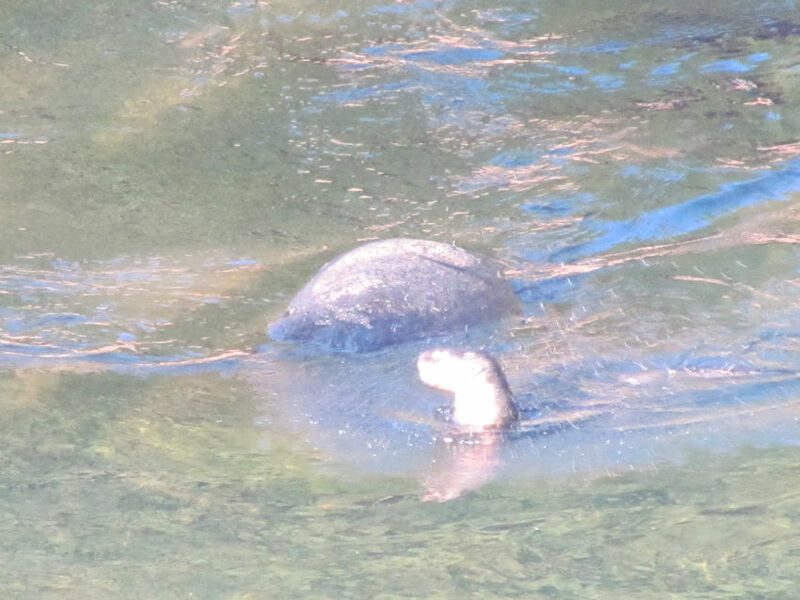 Not a very good photograph, I'm afraid, as they were quite some distance away and I had to use the digital zoom. Also an unidentified raptor again at some distance. On the 5th June about 6pm I was washing the dishes when I saw a movement through the window. On investigation I found another barn owl chick fluttering around trying to get above the courtyard wall. It eventually landed in the concrete wash basin where Pat caught it and brought it inside. 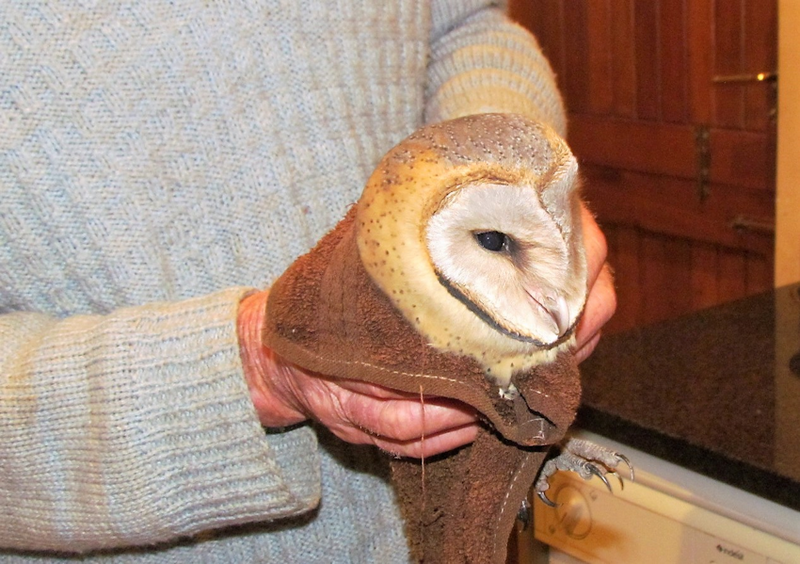 This was 3 weeks after we delivered another barn owl chick to Free Me. I have read that owls sometimes lay their eggs weeks apart and this seemed to prove it. So the next day it was back to Free Me. We have now enclosed the chimney with wire mesh. I just hope the mother does not go to the other chimney where the rock pigeons are nesting. 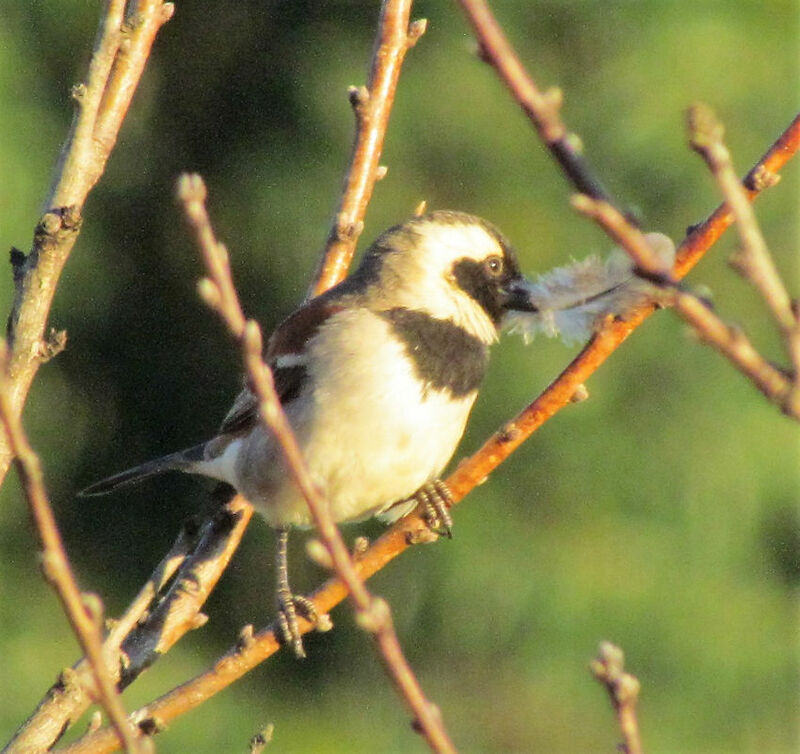 I captured a picture of one of our common sparrows with a feather in its beak and it then flew under the eves of the roof. Can’t believe they are still breeding at this time of the year, and the same goes for our pair of wagtails. Mom has had her eye on my pot plant in the corner of the verandah. It is flowering so perhaps shes attracted to the flowers. She sits there and cheeps until dad arrives. He sits on the balustrade and just looks at his crazy partner –“don’t you know its winter? ?” He cheeps. They both fly off. Half hour later she brings a long piece of grass and a dead gyranium flower and places it over my plant. Then I don’t see them for the rest of the day. I don’t want them nesting there again, because 2 years ago when the 3 chicks were 10 days old I found them dead on the verandah floor. Not sure whether they were thrown out or fell out but I found it heart breaking. So now every time a piece of grass gets placed on the pot plant, I take it away. They must go nest in the jasmine creeper where they normally nest. Another pair of Egyptian geese have hatched out 4 chicks – I don’t know whats going on with the birds and water fowl this season. We saw a rabbit/wild hare on our lawn late one evening, sitting very still. We have also had a duiker in our garden. When Pat chased it one morning it crept through an opening in our old gate (which has now been fixed). The blue crane are still eating from the cattle feeding tyres every day. I watched the wattle crane having a wonderful bath in the dam one hot morning. Just after my skink left our bedroom last month, a few days later I was watering the pot plants on the verandah when he suddenly appeared once more. He walked to the door and checked it out. Still plugged with tissue paper. He turned and looked at me. I told him to go play with his mates. Haven’t seen him again. I actually miss him. For the first 2 weeks of june when taking the dogs for a walk we often passed an adult female reedbuck with her baby who looked a few weeks old. I did manage to eventually get a picture of the two of them together one evening. The next day there was a runaway fire which came from the dargle area and burnt out the hill on our farm. Besides the trees and azaleas which were burnt I was really concerned about our little baby reedbuck who used to sleep in the long grass there each day where mom had left her. She would return each evening. On the day of the fire, when the plantation behind our house was still burning, the mom ran past us at the stone wall looking for her baby. She ran across the burnt out hill and would then stop, as if listening and look around. I felt desperate for her. She then ran back again past the burning trees and disappeared. Two days later I was over the moon to see mom and babe reconciled. We have about ten black winged plovers eating amongst the cattle. Our pair of shell duck are still with us. The dam is very low now and shortly, most of the water fowl will sadly leave us until it fills up again in spring. 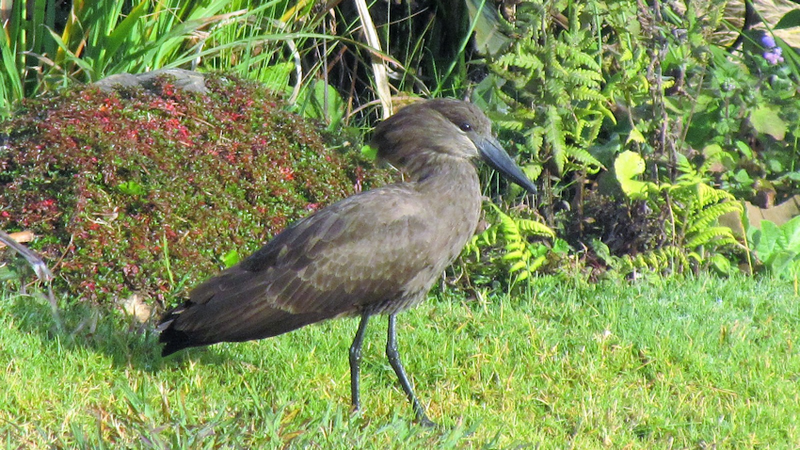 A hamerkop visited the garden one morning. 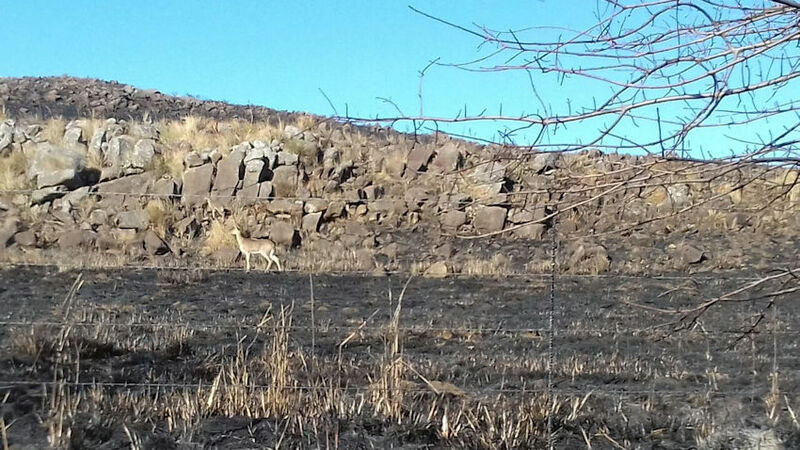 After the fire, we had a number of jackal buzzards and crows flying around looking for scorched insects. The gymnogene has also been hopping around my leafless shrubs looking for food. 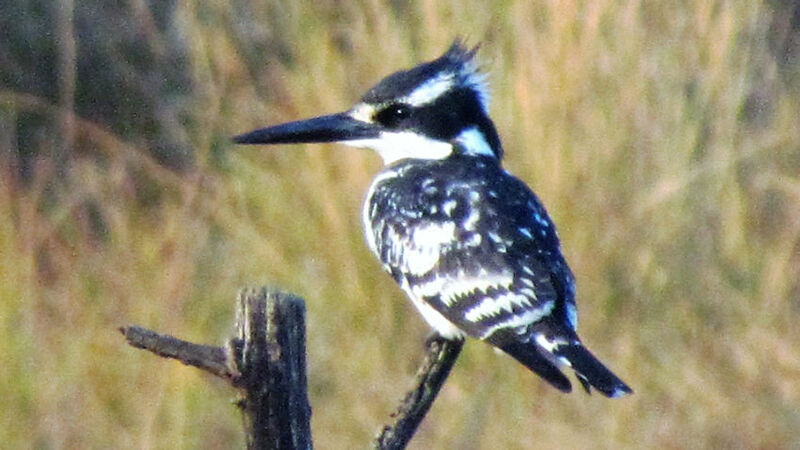 We have seen the pied kingfisher sitting on a dead log around the pond area waiting to catch a meal. We saw him diving into the pond but he came up unsuccessful. He must catch something as we see him quite often. Thats all for June. Just 2 frosts so far. Saw 2 white birds in the little dam. They were ibis looking, pure white with spoon shaped bills (African spoonbills?). Never seen them before on the farm. They were hanging out with the Egyptian geese.